The Queen Elizabeth Queen’s Suite is the entry-level room category for Queen’s Grill guests. It is like a junior suite in a hotel, with a spacious living area and large marble bathroom. There is also a small dressing area as well as a double-sized balcony with outdoor furniture. Plus, all Queen’s Suites have the services of a butler. The Queen’s Suite is a lovely space, but as this luxury cruise review explains it may not meet the expectations of all luxury cruisers. The Queen Elizabeth Queen’s Suite is well suited to those who like more space. In fact, I think the sense of space is the best asset of the Queen’s Suite. 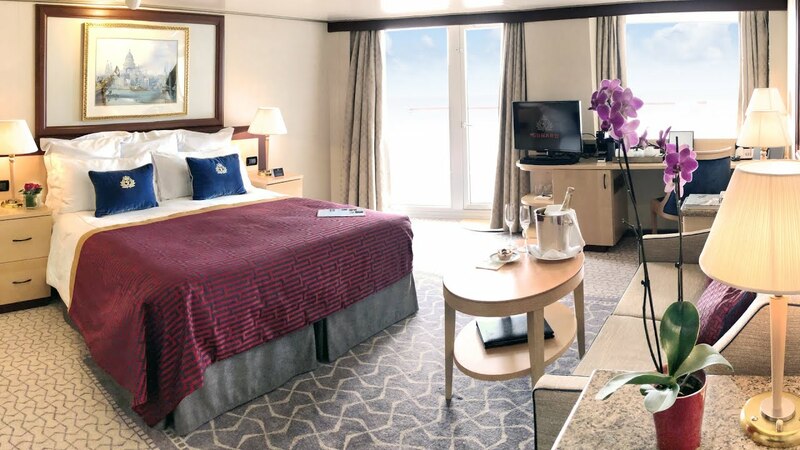 There are two Queen’s Suite categories (Q5 and Q6) and they were both refurbished in November 2018. The decor is now similar to that found on sister-ship, Queen Mary 2. Carpets and sofas were replaced as well as other soft furnishings. However, the effect is not quite as elegant as that of QM2. See how it compares to the Queen Mary 2 Queens Suite. The balcony in the Queen Elizabeth Queen’s Suite also received new outdoor furniture during the refurbishment. This is a great improvement. Guests staying in a Queen’s Suite enjoy the service of a classically trained butler. He will help with everything from packing to booking a box in the Royal Court Theatre. Queen’s Suite guests also get a range of other privileges too, including early embarkation, priority luggage delivery, welcome bottle of Champagne and an afternoon canapé service. In addition, Queen’s Suite guests may select two bottles of spirits for the in-suite mini bar on embarkation. The Queen Elizabeth Queen’s Suite floor plan is similar to a junior suite in a hotel. There is a combined bedroom and living space with a glass door that leads on to a gracious balcony. Behind the living space is a dressing area as well as a marble bathroom. The Queen Elizabeth Queen’s Suite floor plan. The Queen Elizabeth Queen’s Suite is one of the most spacious rooms onboard. In fact, each one measures between 45.0 – 62.3 sq. m. / 484 – 671 sq. ft. including the balcony. It’s worth noting that the interior space of all the Queen’s Suite categories is roughly the same, only the size of the balconies varies. Indeed, Q6 category suites located at the stern have larger wrap-around balconies. In 2018 the living space in the Queen’s Suite was ‘remastered’ in the style of Queen Mary 2. Now there is a palate of grey, red and royal blue. There is new carpet with geometric inlays and in addition classic-style artwork hangs from the walls. The king size bed is comfortable, however there are no bedside power units for charging mobile devices. On one side of the living space is a king or twin bed setup – the choice is yours. There are fine linens and a selection of pillows is available, including U-Shaped, Duck Feather and Roll Neck. On either side of the bed are nightstands with deep drawers for storing books and other personal items. Sadly, there are no bedside power units to charge your mobile devices. The rather hard and uncomfortable sofa in the Queen’s Suite is less than luxurious. A convertible sofa-bed sits on the other side of the suite. This means the Queen’s Suite can accommodate a third guest. However, in sofa-mode this couch is very firm and uncomfortable. By no means does it feel luxurious. There is also a writing desk with ocean views. It’s a pleasant place to work, although it is cluttered by the in-suite tea service. The Queen Elizabeth Queen’s Suite also comes with an Illy espresso machine – it’s a nice touch. There is also a mini-bar stocked with soft drinks. There is a small flat screen TV in the Queen’s Suite. Sadly, the entertainment units in the Queen’s Suite are well below standard for luxury cruising. The television screen is small and mounted on the edge of the writing desk, rather than on the wall. In addition there is an iPod music dock. However, the old 30-pin connection is only compatible with iPhone 4s and older models. The iPod dock only fits the iPhone 4s and older models. The balcony in the Queen Elizabeth Queen’s Suite is a delight. It is glass fronted for unobstructed views. It is the perfect place to put your feet up with a good book. The Queen Elizabeth Queen’s Suite balcony has plenty of room for the stylish outdoor furniture. This double-size balcony has ample room for a set of reclining deck chairs and ottomans. In fact, the wrap around balconies at the stern have even more space. Although I have to say the space on these largest of balconies is rather under-utilised. Indeed, the side portion of the balcony is something of a dead space. It’s also worth noting that the balcony in the Queen Elizabeth Queens Suite is not teak. Rather, it is a faux teak surface more common to less luxurious cruise ships of this vintage. Indeed, luxury cruisers who have sailed in Queen’s Suites onboard QM2 are sure to notice the difference. The bathroom in the Queen Elizabeth Queen’s Suite can best be described as practical and spacious. Unfortunately, it did not get much attention during the recent refurbishment. The Bathroom in the Queen’s Suite is spacious and has a Jacuzzi bath tub. Indeed the bathroom has not changed significantly since Queen Elizabeth first set sail in 2010. So by the standards of modern luxury cruise ships it can be considered below par. This shows in the moulded plastic fixtures and storage spaces. They look dated and somewhat unattractive. That said, the bathroom is clad in attractive marble. It also has a marble vanity with dual basins. There is a Jacuzzi tub and a separate shower. However, here again the bathroom shows its age with the shower having a curtain rather than a closing glass door. So the shower is prone to leaking. It’s also worth noting that the shower is small. I often managed to knock my elbows on the protruding shower handles. In addition, during my review voyage the water pressure was weak. There are quality Quercus bath products. The Queen Elizabeth Queen’s Suite bathroom is stocked with fine Quercus bath products from Penhalington’s of London. The Queen Elizabeth Queen’s Suite has a dressing area with its own makeup table. It’s a real treat, especially for the ladies. The dressing area includes a wardrobe and plenty of drawers. Also there are spaces around the makeup table for storing personal items. The Queen’s Suite has plenty of hanging space in the wardrobes. There is a second wardrobe in the main living space. It is significantly larger than the wardrobe in the dressing room, with room to hang two cases full of clothing. Handy drawers under the bed are ideal for bulky cold weather clothes. In addition, there are two deep drawers under the foot of the bed for storing items used less often. However, unfortunately there is not enough space under the bed to store large luggage cases. There are a total of fifteen Queen Elizabeth Queen’s Suites. All of them are at the very back of the cruise ship on decks 4, 5 and 8. The Queen’s Suites are all located at the stern of the Queen Elizabeth. There are two Queen’s Suite categories: Q5 and Q6. The Q5 category is generally more expensive, but it’s worth noting that the interior space of both categories is almost identical. The real difference is the size of the balcony. Q6 category suites are located on the aft corners of the ship with wrap-around balconies. These balconies are significantly larger. It’s also worth noting that the Queen’s Suites are located some distance from the exclusive Queen’s Grill facilities, like the Grills Terrace or the Queen’s Grill Restaurant. This means you may face a long walk through the austere corridors to reach the Grills Lounge and Restaurant. I think the best thing about the Queen Elizabeth Queen’s Suite is the large balcony. It’s a real winner. However the same can’t be said for the living space which, in spite of the 2018 makeover, suffers from a somewhat tired design. It lacks the panache of the Queen’s Suite onboard QM2. Also, the bathroom is less than impressive. Luxury cruisers should weigh all these factors when considering the the Queen Elizabeth Queen’s Suite.